Keyboard shortcut Windows-R, in Run Command, how to change? As default the keyboard shortcut Windows + R is provided for Run Command, but can be changed at any time! If you want to change this, press the button ► Options ► Hot-Key and change the keyboard shortcut. Please always use ... the newest version of Run-Command for Windows and Server! (Image-1) Keyboard shortcut Windows-R, in Run Command! With this alternate execute command dialog you will not be patronizing when choosing the shortcut to start Windows commands and / or running programs you know at any time switch back to using the standard Windows + R keyboard shortcut. As you can see above in Windows 10 shot screenshot, it's easy. However, you can easily apply this solution to earlier versions of MS Windows. When choosing the shortcut to start Windows command it does not matter if it's a simple Windows desktop PC, tablet computer, Surface Pro / Go, or even a server operating system. 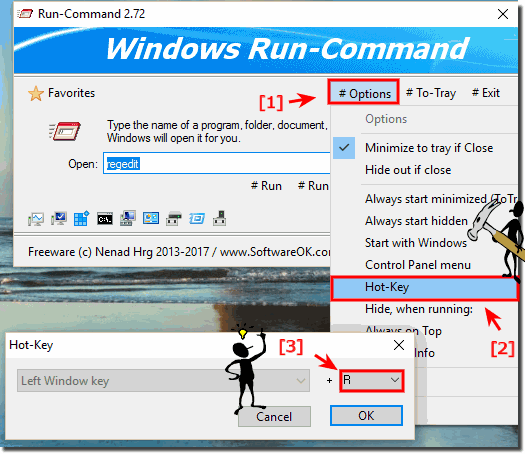 Run-Command - FAQ-7: Keyboard shortcut Windows-R, in Run Command, how to change? Keyboard Shortcut to Run as administrator in RUN-Command Dialog? Hide when run: commands, favorite cmd-s in Run-Command - Windows 10, 11, 8.1, 7! I love the RUN-COMMAND program, but after I've used it a couple of times it replaces the WIN+R option which I also like to use. Can I keep the Run-Command from replacing, or once it has, how can I get the WIN+R back?